Off to a great start! Is that link supposed to work? It takes me to a general IBM site. 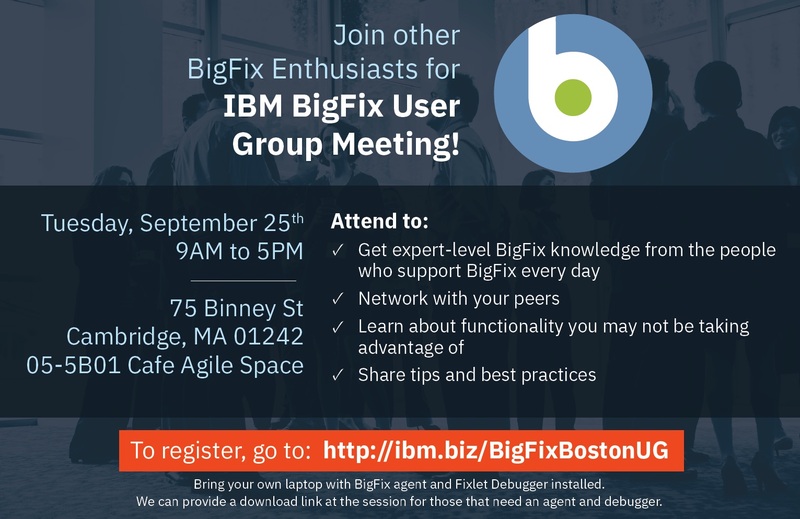 Worked for me (re-directed to https://www.eventbrite.com/e/bigfix-boston-user-group-tickets-48399173230). Please note that the URL is case sensitive. Thank you. That worked. The link wasn’t clickable, hence not a link by definition, so I had to manual type it. For a fraction of second I thought it may be case sensitive but dismissed that as being absurd. Anyway. I’m good and am registered. Is there parking in or around 75 Binney St? There is a parking garage about 2 blocks away. The CambridgeSide Galleria mall is typically where I park when visiting this office.